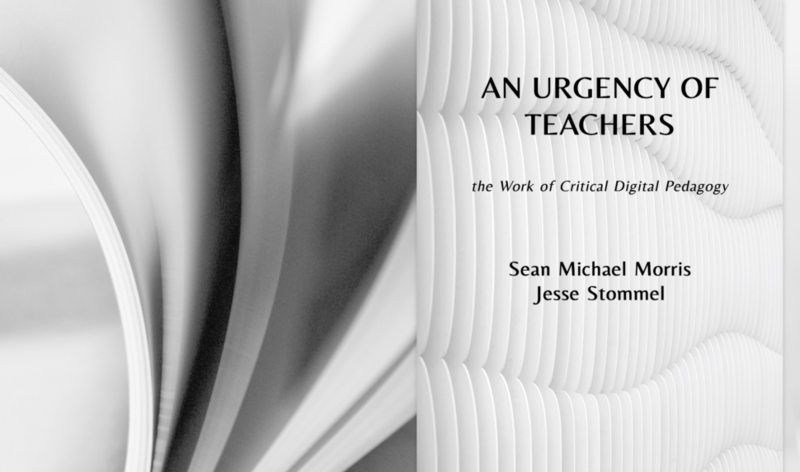 Review: An urgency of teachers: the work of critical digital pedagogy by Sean Michael Morris and Jesse Stommel. An Urgency of Teachers: the work of critical digital pedagogy is a collection of intelligent counsel and an emotional summons. Sean Michael Morris (@slamteacher) and Jesse Stommel (@jessifer) can be arresting poets. When I first stumbled upon Jesse and Sean, I heard their voices through Shakespeare. Sean was writing in his own voice, with his own heart, about learning and teaching, about the morals and ethics of education. I heard my unspoken feelings about why I don’t write academically in my field. I felt a bit less embarrassed about feeling more drawn to digital writing than academic writing. I felt why I am so torn, after fifteen year in higher education, by the relentless desire to contribute to research in my field as a learning designer, but my own sense of self-resistance against pursuing this writing in an academic style. ACT 2, SCENE 1…THE WOOD, IN-BETWEEN. I am someone who has wandered for years, following the dappled light that Sean and Jesse radiate in words, including taking an online Digital Pedagogy Lab course – Learning Online in 2015. Serendipitously finding hope and inspiration for my own work, An Urgency of Teachers is the pocket full of stones and feathers I carry, collected in a way that I can point others to the landscapes through my story of finding them. I am only just beginning to find my way. Closure? Is this an end? A final act? An adieu? I will run with the book in this way. It gathers two voices whose work together is now bound and held in a form, but only in the same way of thinking about a forest like a mere collection of trees. Where does the forest begin or end? Where is the edge? Where is the heart? Unfindable, yet everywhere. In places, we might begin to see a noticeable thinning of tall trees, they may seem less prominent. Yet, a forest has no ending and beginning. ACT 3, SCENE 1… ANOTHER PART OF THE WOOD. Parts of this book, because it has words that call you to activism, may make you feel helpless in your daily work. You may inadvertently build a sizeable wall around yourself out of the touchstones you collect. The power of this book is that it urges us. It urges us to notice that ideas, sharing and knowledge, so easily seek to inhabit in between the gaps in the walls. The authors are aware that we don’t all have a privilege of position to openly question the LMS out aloud. I feel complicit in enabling some of the very practices I question. I must stand and deliver messages of good practice, learning management systems and text-matching software, and still find a way to believe wholeheartedly in my work. Through this body of work of critical digital pedagogy, I have come to feel very good indeed about being so troubled by my own work. About how very lost in the woods this collection of voice and heart makes me feel. It is in this dark space, that I am feeling critical digital pedagogy as it is intended. It creeps up my spine in the dark shadows of the woods. To know, that when I am asked questions, I should answer those questions with a courage in my own voice. Perhaps most of all, I love that this book is entirely about more and more questions in a thicket of praxis, pedagogy, learning spaces, digital culture, digital writing, ethics and action. It seems so fitting to be back again at the start of the book when I thought I had reached the end. The clarion voice of Audrey Watters (@audreywatters) opens the collection. Another who has a bold voice to make me see that digital words can wield a sharper power. So, listen. There. A rustle. A call through the woods. Don’t just click on this book. Don’t just flick through pages. When trees have been felled for words, go out with your own words, into the world and play. An Urgency of Teachers is available. So avail yourself. And this is how, through an Urgency of Teachers, I again found myself standing beside tall trees, yet hearing my own voice.